Amazon's Kindle is king of the castle when it comes to eReader technology. However, by making some powerful new friends, Rakuten Kobo taking the fight to the online behemoth and offering a few extra services on the side. Rakuten (pronounced "Luck-ten") was founded as MDM, Inc. in 1997 by Harvard-educated former banker Hiroshi Mikitani in Tokyo, Japan. Later that year, the company launched its first online marketplace, Rakuten Shopping Mall. Taking its name from the Japanese word for optimism, the company became Rakuten in 1999. In 2011, Rakuten began expanding outside of Japan with a stake in Canadian eBook reader manufacturer, Kobo Inc., and completed the full purchase of the business the following year. Today, Rakuten operates in 29 countries and regions and employs over 14,000 people. The company has revenues of Y=781.9 billion, and holds the #26 spot on the Forbes list of The World's Most Innovative Companies. Rakuten Kobo recently announced its intention to break into the US market and take on Amazon Kindle for eReader market dominance, with a little help from an American retail giant - Walmart. 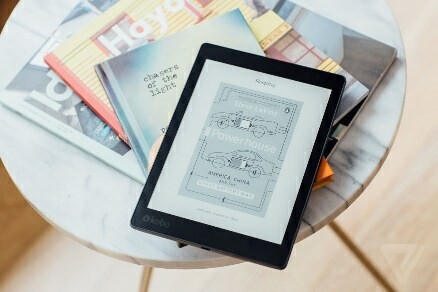 Branded Kobo/Walmart eReaders will be sold via the Walmart website and in its huge network of brick-and-mortar stores, along with software applications, and digital book cards. The Walmart deal echoes efforts Rakuten Kobo has been making across the globe to establish itself as a leading eReader brand. When Rakuten first acquired Kobo, it allowed the company to beat Amazon into the Japanese marketplace. Now a deal with UK newsagent and bookshop, WH Smith, aims to achieve similar goals on that side of the Atlantic. The efforts are bearing fruit. Kobo's bigger-screened, water-resistant Aura One, beat Amazon's similar new Kindle Oasis to market by more than a year. "Walmart is one of the top retailers in the world, and one of the largest booksellers in the US," said Rakuten Kobo Chief Executive Officer, Michael Tamblyn. "Our strategy from day one has been to partner with the world's best retailers, so that they can easily offer their customers the option of reading digitally. This informs the software and devices we create, the books and authors we promote, and also the partnerships we build. For us, this is another great opportunity to serve book lovers at Walmart, those people who make reading an important part of their lives." The partnership with Walmart doesn't begin and end with eReaders, however. Walmart subsidiary Seiyu GK is establishing a joint venture with Rakuten to launch a new digital grocery delivery system in Japan. The new service, dubbed Rakuten Seiyu Netsuper, will showcase Seiyu GK's philosophy of quality products at affordable prices, and will aim to serve customers with rapidly-delivered groceries right to their front doors. The service will offer fresh produce, daily consumables, and a wide range of convenience items such as pre-prepared vegetables and ready-meal kits. Rakuten Seiyu Netsuper will also have the freedom to offer local favorites and gourmet items, depending on the user's location, and AI- and data-driven personalized offers. "As global leaders in e-commerce and offline shopping, Rakuten and Walmart are uniquely positioned to empower our customers around the world with innovative services," said Rakuten Chairman, President and Chief Executive Officer, Hiroshi Mikitani. "We are excited to partner with Walmart because of its commitment to creating the best solutions to serve customers with low prices." Walmart is a powerhouse of retail and ecommerce, and makes an ideal partner for Rakuten Kobo to expand its marketplace for not only its proprietary eReader products, but also digital grocery ordering and delivery. Amazon's Kindle may be the world's most recognized brand of eReader, but Rakuten isn't letting itself be intimidated, and is dedicated to taking the internet giant on. The final word goes to Walmart President and Chief Executive Officer, Doug McMillon. "Rakuten is a strong ecommerce business, and we're excited to collaborate with the top online shopping destination in Japan. Here in Japan and everywhere we operate, we're constantly exploring new ways to make every day easier for customers by offering great experiences in stores, online, via mobile, no matter how customers want to shop. We look forward to expanding our grocery footprint in Japan and launching a new offering of eBooks and audiobooks for our customers in the US." You can hear Rakuten Kobo's Chief Executive Officer, Michael Tamblyn, speak at eTail East 2018 this August at The Sheraton, Boston, MA.